Well, I can’t really concentrate on pattern reading in the bleachers of some exciting games… Hmmm… So what to take… Ok, I decided to make up some Infinity Cowls… Last week on my Facebook Free Pattern segment,,, I featured a really cute cowl from Ravelry, Lots of you really like this pattern that I featured… So I made one up, inspired by some of her design,,, And of course… I had to add some of my own touches! 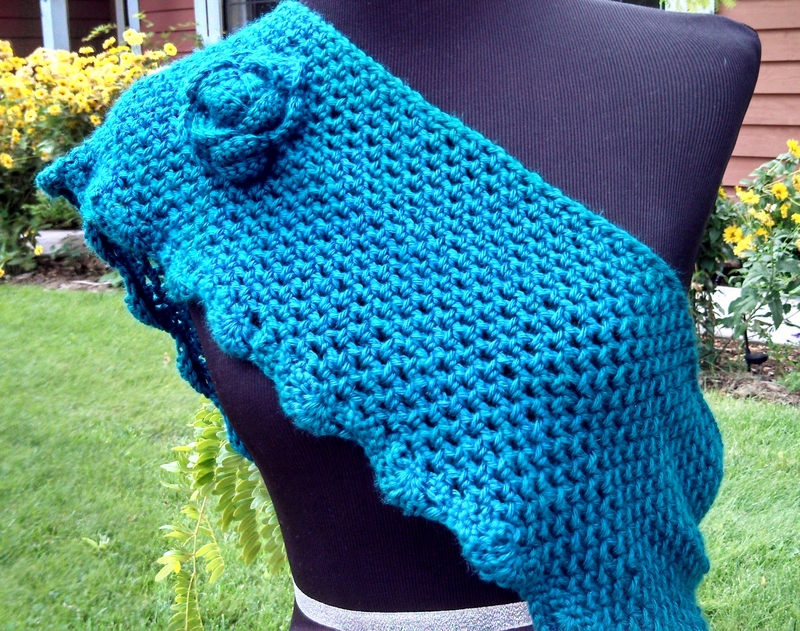 A ruffled edge and my own flower that I use on most of my designs… It was made with a great teal color from Caron Simply Soft…Love it! By the time we got home and got reorganized,,, I sat down for a little more crochet… Since I was on a roll and several people asked for the pattern I used last week in my Infinity Cowl with Sequins,,, I thought I should continue to work on that pattern too! 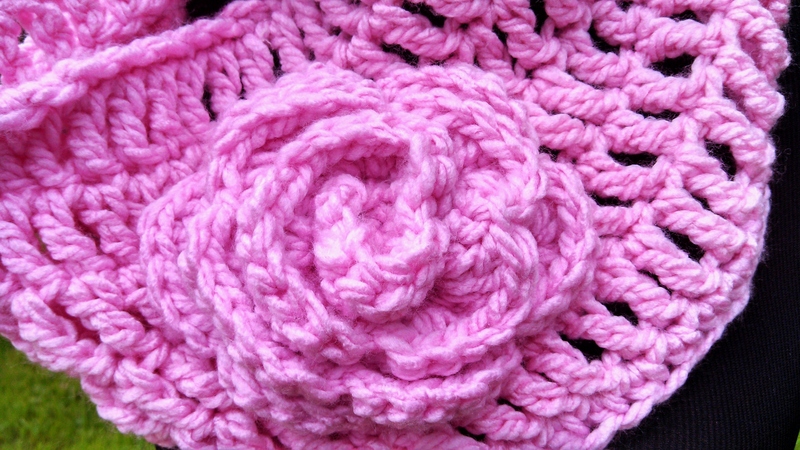 So because I had just picked up some more yarn,,, I pulled out some great chunky yarn in Pink that I just bought by Deborah Norville… I whipped up another one of my own designs and decided it needed to have one of my flowers too! 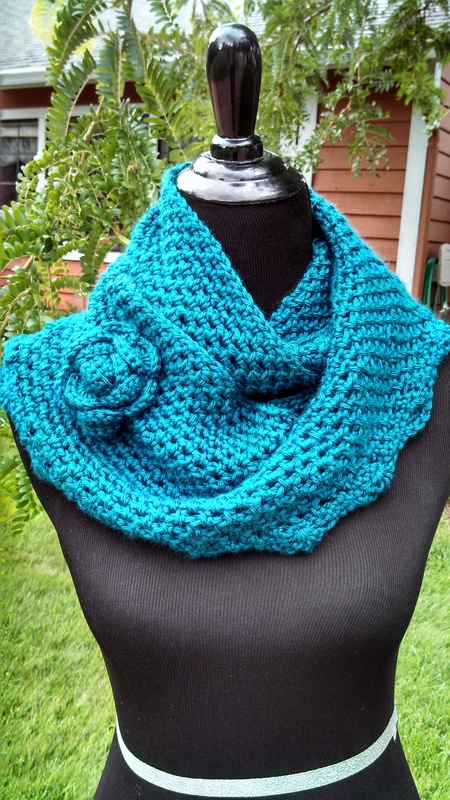 This pattern is more a cowl than a scarf… I love the way this one turned out too!!! What do you think… I can’t decide!!! I want to keep both for myself,,, But,,, I am putting them both in my Etsy Shop! 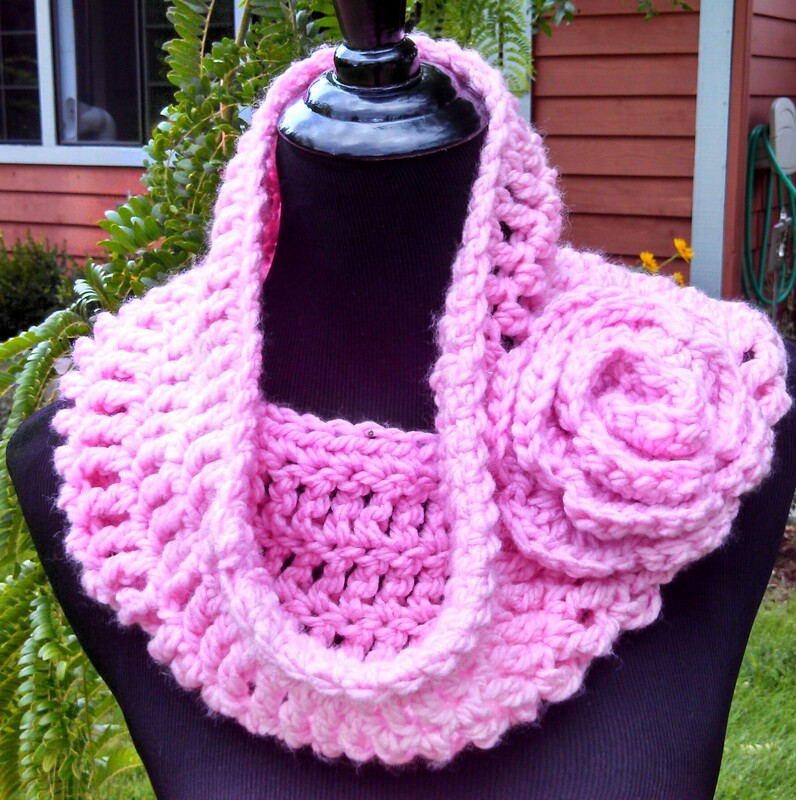 So here is to Crocheting at Volleyball, Infinity Cowls and Flowers! Crazy Good Mat Pattern Test…. 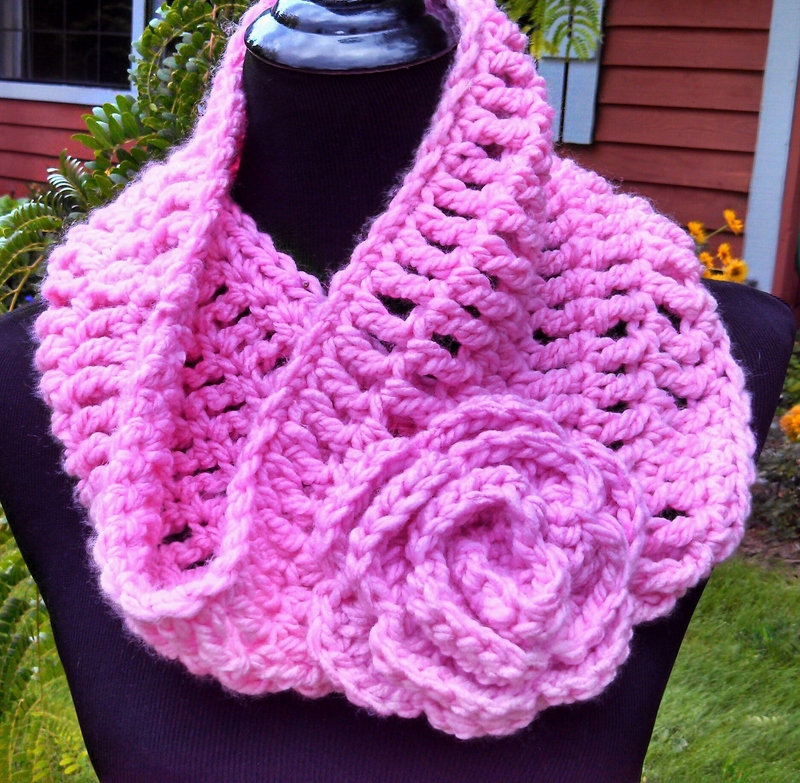 I really love these cowls with flower. Is the pattern available? I admire your work so much, are the patterns available for other projects, as well? Keep up the good work. It’s amazing how much you accomplish each time you post. I’m in awe! p.s. My granddaughter just entered High School and my grandson is beginning his Senior Year..we have more than crochet in common. Plus, I believe you are somewhat acquainted with my sister-in-law, Ronelle Nichol, who lives in Mt. Shasta. So, there you go! The pink cowl pattern will be available soon as well as the sadie hat… If the pattern isnt mine I try to post where I got it, The teal one is just an partly an adaption of one I recently saw and modified to make it how I wanted it.. It is HDC, Ch 1 around… About 150 stitches… then alternating HDC in each Ch 1 from previous row and chain 1 over the previous HDC so it makes a mesh… Then I made a shell ruffle…… Thanks for all the support and I do know Ronelle! She is very nice!! 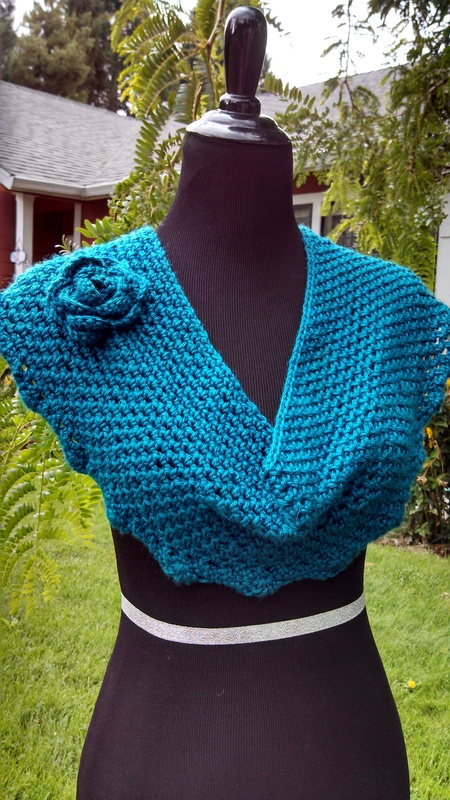 I love your cowls! I look forward to the pattern coming out! It will go perfect with some of my hats!